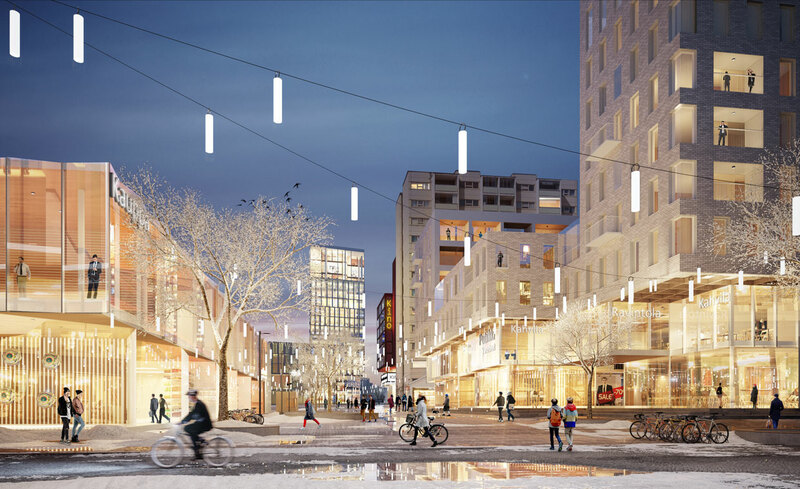 A study to revitalize and strengthen the Kerava downtown area with new and infill development. The main focus is on the central pedestrian zone. Kauppakaari pedestrian street is given new clearly defined endpoints while the central Keravan Aukio market square is strengthened with a new multipurpose market hall building. New western endpoint is dominated by a hotel and congress building while the eastern endpoint, Puuvalonaukio, is given a more urban condition with clearly defined borders and a better connection towards the park and the train station. The train station area is renewed with a more efficient bus terminal and new infill buildings to improve the connection to both the Kauppakaari area and the central Aurinkomäki park.